Product #20504 | SKU 71332 | 0.0 (no ratings yet) Thanks for your rating! 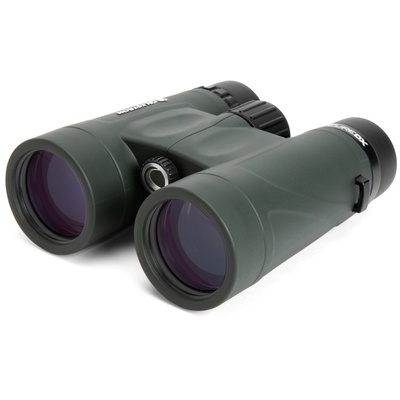 The 8x42 Nature DX Binocular from Celestron is a weather-sealed optic designed for close to mid-range observations. This lightweight binocular weighs less than 2 lbs and is compact enough to fit in the side pocket of a daypack. In addition to the Nature DX series' streamlined form factor, this fixed-magnification binocular also features fully multicoated optics and phase-corrected BaK-4 prisms that render enhanced clarity and color fidelity. An immersive 59° apparent viewing angle and impressive 6.5 ft minimum focus distance complement the 8x42 lens system and help provide a user-friendly glassing experience. The Nature DX binocular has a nitrogen-filled polycarbonate housing that is built to withstand heavy rain and deliver fogproof performance, making this Celestron optic ready for a wide range of outdoor glassing activities. 56 - 74 mm / 2.20 - 2.91"